This week is the start of the PhotoPlus Expo in New York. Display manufacturer, EIZO, announced today that during the tradeshow they’ll be showing off two new color ColorEdge color management monitors. The monitors are the CG2730 and the CS2730. Both are 27-inches and feature a 2560 x 1440 resolution. According to EIZO, these new monitors are super thin, with the bezel half the size of previous models and the monitor depth 30% thinner. Both monitors feature three USB 3.0 ports, HDMI, Display Port and DVI input ports and carrying handles. The CG2730 comes with a removable shading hood and out of the box support for softwire like ColorNavigator 6 and ColorNavigator NX, but otherwise, the CG and the CS seem to be very similar options. If you’re attending PhotoPlus, you can get some hands on time with the new monitors. CYPRESS, Calif., October 11, 2016 – EIZO Inc. today announced the new ColorEdge CG2730 and CS2730, two 27-inch monitors with a 2560 x 1440 resolution for professionals and aspiring creatives in varying fields. 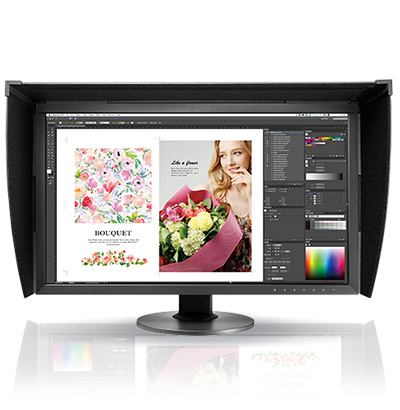 EIZO will be showing the ColorEdge CG2730 and CS2730 at PhotoPlus Expo 2016 in Javits Center, New York City, NY from October 20 – 22. Visit Booth 665 to see the products. 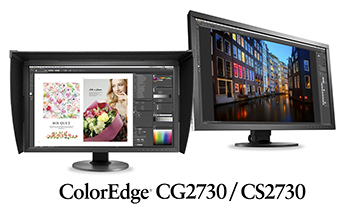 The ColorEdge CG2730 and CS2730 are shipping November.